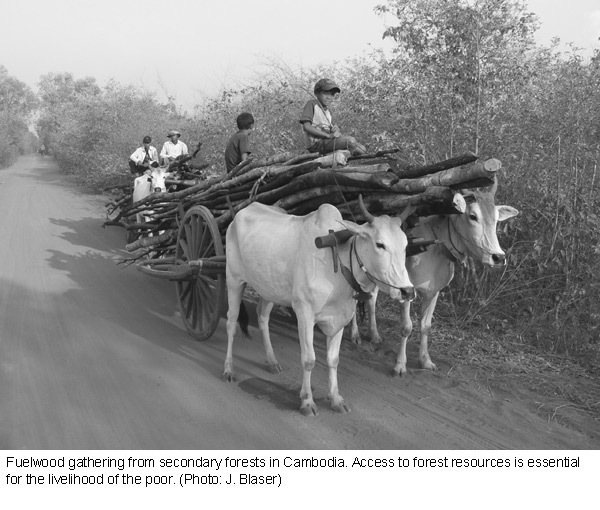 > Decentralisation of forest governance: Does it work? > Higher rice yields with less input? Products are referred to as “sustainable” if their production and marketing has greater positive, or smaller negative, social, ecological and economic impacts compared to conventional products. The market for sustainable products is still rapidly growing. Many consumers prefer certified sustainable products, considering them advantageous with regard to health, the environment, and taste. In developing countries, the market for sustainable products is still very small, but in economically emerging nations this could soon change. At a first glance, farmers in developing countries seem to have a head start for producing sustainable products according to organic farming standards: the ready availability of cheap labour fits in well with the labour-intensive production methods. Moreover, traditional agriculture as it is usually practised by small-scale farmers often hardly differs from organic agriculture. Along with these comparative advantages, however, there are also several disadvantages. Unlike in industrialised nations, in developing countries there are generally no government subsidies for organic farming. The fixed costs for organic product certification are high. Farmers largely lack bothinformation on markets and access to them, and domestic markets are as yet non-existent. In an effort to improve this situation, a number of initiatives to promote sustainable products have been launched at the national and international levels. 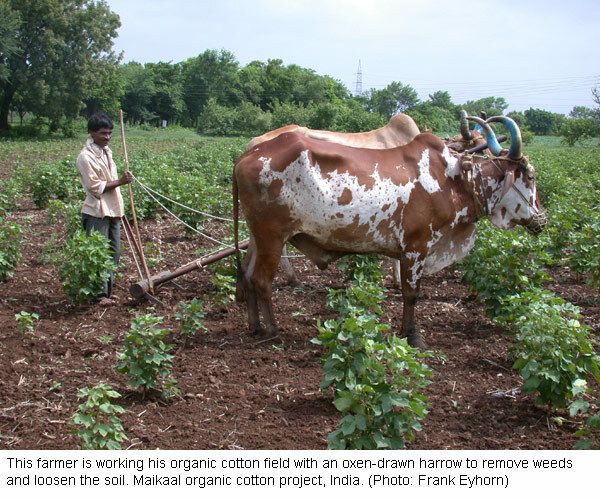 Organic farming is already practised in many developing countries. Two studies by the International Fund for Agricultural Development (IFAD) in Latin America and Asia have examined the potential of organic agriculture for reducing poverty. Both studies have revealed that farmers who switched to organic farming were always able to increase their income. Depending on their initial situation, they could either reduce production costs or increase yields. In addition, they benefited from higher prices for organic products. IFAD's studies have also shown that the adoption of organic farming has positive effects on ecology, although to date only few research projects have investigated this aspect: organic agriculture leads to an increase in animal and plant species, can help to improve soil fertility, and uses less water than conventional agriculture. Organic farming has therefore led to considerable success particularly in areas with difficult agroecological conditions. These results show that organic agriculture does have a potential to reduce poverty. It creates opportunities to increase income and reduce risks by enhancing ecological stability. In addition, it contributes to diversifying agricultural production. However, successful adoption of organic production is not easy to carry through. Most importantly, farmers need advice on organic cultivation technologies, but they also need access to market information and marketing know-how. Finally, they often depend on financial support during the phase of transition, which usually takes about three years. The evaluation of a Swiss-supported organic cotton programme in Mali, Kyrgyzstan and Burkina Faso has reached similar conclusions. Like the IFAD studies, it also puts particular emphasis on the importance of strong producers' associations. This type of cooperation allows farmers to professionally organise and coordinate the marketing of their products. Moreover, it gives them the opportunity to exchange experiences and secure quality control. Organic agriculture is one of many adequate instruments to reduce poverty. However, the price advantage will soon dwindle if too many farmers switch to organic farming and the supply of organic products increases more rapidly than the demand for them. 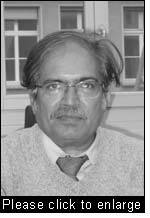 > Organic Agriculture and Poverty Reduction in Asia: China and India Focus. 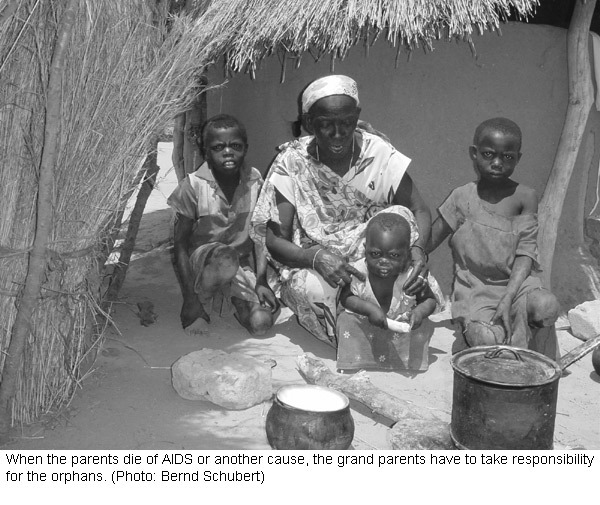 International Fund for Agricultural Development (IFAD), July 2005. 137 p.
> Evaluation Externe du Programme Coton Biologique Mali, Kirghizistan et Burkina Faso / 2005. Mandat du Secrétariat d'Etat à l'économie (seco) présenté par Joseph Guntern et Christof Dietler. Octobre 2005. 22 p.
The Ethiopian highlands are marked by a vicious circle of food insecurity and ecological degradation. More frequent droughts, land degradation and population growth have led to a situation where more and more food needs to be imported from outside. Researchers from the International Food Policy Research Institute (IFPRI) have used a bioeconomic model to identify development strategies for improving the situation both of households and of the environment. The model takes into account a multitude of biophysical and socioeconomic factors. The model calculations have indicated that tree planting and a food-for-work soil conservation programme are the most promising measures to improve the situation: they can help to increase household income and at the same time promote more sustainable land use. By contrast, measures such as credits for buying fertiliser or the promotion of external sources of income only make sense when combined with natural resource conservation measures. This model could yield interesting results for other regions as well, provided that the data necessary for the analysis is available. Policy Research Institute (IFPRI), 2005. 45 p.
Changes in ecosystem services have crucial impacts on poverty. The linkages between ecosystem services and human well-being have been addressed in the comprehensive Millennium Ecosystem Assessment (MEA) Synthesis Report. A literature study in Uganda has now applied the MEA framework. After a short overview of Uganda's landscape and people, the report discusses the most important ecological services currently under stress, followed by the related threatened components of human wellbeing. In both sections, the geographical locations concerned are indicated for each item. A next section compares the regions where ecosystem services are under stress with the regions where constituents of human well-being are threatened and briefly outlines the main linkages. A declining capacity of the ecosystems to adequately feed people, the loss of wetlands, dwindling fuel sources, and a high risk of water supply crises are identified as the key issues. This report is part of a series of seven studies. Similar reports have been published for Tanzania, Rwanda, Mozambique, Mauritania, Mali and Kenya. Even if not exhaustive, these studies do offer useful guidance in how to select priority areas. Source:Connecting poverty & ecosystem services: Focus on Uganda. A series of seven country scoping studies. Carissa Wong, Marlene Roy, Dr. Anantha Kumar Duraiappah. UNEP, IISD 2005. 36 p.
Decentralisation of forest governance: Does it work? Over the last two decades, many countries have made efforts to decentralise the governance of their forests. This process was expected to bring about increased participation, accountability and democratisation in forest governance. In reality, however, decentralisation is not a panacea, nor does it necessarily lead to equity and efficiency. On the contrary, it has often entailed conflicts when existing tensions among competing individuals or groups of stakeholders were intensified due to legal and administrative uncertainties. Nevertheless, under certain conditions decentralisation can yield positive results and contribute to poverty alleviation and sustainable forest management. Successful efforts share several important features: secure land tenure; secure fiscal, revenue and taxation powers; equitable access to forest resources; control over decision-making; commercial rights and market access; and sensitivity to cultural traditions and local knowledge. Enabling legal and policy frameworks, along with basic institutional capacities, are a precondition for successful decentralisation. Further requirements include the capacity to conduct negotiations among different, unequally powerful stakeholders with competing interests, as well as conflict-solving capacities. Decentralisation processes are time-demanding and should be implemented gradually, giving stakeholders and institutions the opportunity to adapt and to learn. Decentralisation works best when driven by reinforcing pressures both from the bottom and from the top. Source: Decentralization: Issues, Lessons and Reflections. Doris Capistrano and Carol J. Pierce Colfer. In: The Politics of Decentralization – Forests Power and People. pp. 297–313. The Earthscan Forestry Library, 2005. In 2003, a study aimed to assess the potential of engaging young researchers in six countries to link up political decision- makers, practitioners and academics working in the fields of information society and sustainable development. The publication “A developing connection” follows on from this study. It is based on case studies where this procedure has been put into practice. In India, researchers brought together leaders of local grass-roots organisations to examine their information technology and communication (ITC) needs. For example, with regard to water management, the leaders suggested introducing an awareness campaign among school children. They also voiced a need for the systematic documentation of the environmental dimensions of managing this natural resource, as well as access to such information. Furthermore, these leaders felt that other areas such as deforestation, natural disasters and the use of fertilisers show untapped potential for ITC applications. Nevertheless, given the stratification of Indian society, such as its caste system, it is not so straightforward for decision-makers to take account of proposals originating from the “grass roots” and passed on by esearchers. At the end of November 2005, St. Petersburg hosted the “Europe and North Asia Forest Law Enforcement and Governance Ministerial Conference (ENA FLEG)”. On the agenda were the development of the Ministerial Declaration and the definition of efforts needed to ensure both the enforcement of legislation and good governance to combat the illegal exploitation of forest resources in Europe and North Asia. In a parallel session, intergovernmental negotiations were held with the Civil Society and Industry Dialogue (CSID) to develop a joint position on the Ministerial Declaration and the Indicative Action Plan. The Ministerial Declaration was adopted by representatives of 43 national governments and the European Commission. At the national level, efforts focus primarily on the revision of legislation, institutional development and capacity building, as well as poverty alleviation. At the international level, action is to be taken on international forestry policy, business and trade, research as well as cooperation to ensure the implementation of the Ministerial Declaration. Higher rice yields with less input? A press release issued by the Institute of Science in Society (ISIS) reports that farmers in southern Nepal have tested a low-input rice cultivation method called “System of Rice Intensification (SRI)” during the past three years. Using only a fraction of the normal amount of seedlings and far less water than usual, their yield has more than doubled. The main innovation was to remove the seedlings from the nursery beds after 2 instead of 6 weeks, transferring them to drained instead of flooded fields. Moreover, the spacing between the seedlings was increased, leading to better root development. While – according to ISIS – more and more farmers are convinced of the new method, scientists remain reluctant. Research institutions such as the International Rice Research Institute (IRRI) continue to promote high-input agriculture and biotechnology. Doubts are being voiced on whether IRRI and the Consultative Group on International Agricultural Research (CGIAR) actually direct their research and its implementation primarily towards improving the standard of living of low-income rice farmers and consumers. ISIS demands that these institutions join in efforts to free farmers of their dependence on agrochemical technologies, promote sustainable agriculture, conserve the environment, and protect the farmers’ health. The results from Nepal are not uncontested. Based on its own tests, IRRI has doubted the effectiveness of the System of Rice Intensification. The topic of “Cash transfers” was investigated in one of the projects presented in October 2005 in Berne at a symposium entitled “Poor health, food insecurity and poverty – How to break a vicious circle?” According to the author, cash transfers are the best-adapted and most effective means of supporting extremely poor households. This judgement is based on the assumption that the beneficiaries themselves know best how to make most appropriate use of the money they are paid. The hypothesis has been tested in southern Zambia in 1000 poor households with limited options for self-help. Each of the households was paid 6 to 8 dollars per month. After a 5-month testing phase, results indicated that around 95% of the beneficiaries actually did belong to the intended target group. The money was spent mainly on maize, but partly also on sanitary products and clothes. Surprisingly, several households were able to accumulate small savings. Some of them invested hismoney in hens, and some households headed by elderly farmers hired workers to help with the fieldwork. In the course of the project, begging decreased, children attended school more regularly, and their nutritional status improved. However, widespread implementation of this approach is hindered by several necessary preconditions, such as the establishment of an extensive network of cash distribution points. Cash transfers therefore remain only one of many possible strategies for public welfare. Source: Pilot Social Cash Transfer Scheme – Kalomo District, Zambia. In many places throughout the world, indigenous people, and in particular women, are key players in maintaining the balance of natural ecosystems. However, when it comes to natural resource management projects, there are numerous obstacles, which prevent the inclusion of gender aspects and indigenous knowledge. The “Indigenous and gender aspects in natural resource management (IGNARM)” network issued a guide, based on a catalogue of experiences in which there is interplay between these three thematic issues. For development practitioners, the guidelines tackle all the key questions, which may arise at each stage of a project cycle: from identification to monitoring/evaluation. During any examination of existing legislation, any contact with communities and local institutions, or the identification of the project's target population, it is essential that the opinions of men and women, both indigenous and non-indigenous, are given due consideration. It is also imperative that women contribute to the design of a project, particularly given that men, for cultural reasons, often find it difficult to accept their involvement. Finally, the identification of the cultural links, which the indigenous male and female populations have with their natural environment and resources, and their respective tasks, will help to provide a better definition of the objectives and activities of the given project. Three families living around a lake earn their livelihood either from rice cultivation, vegetable farming or livestock breeding. All three families depend on the use of lake water. 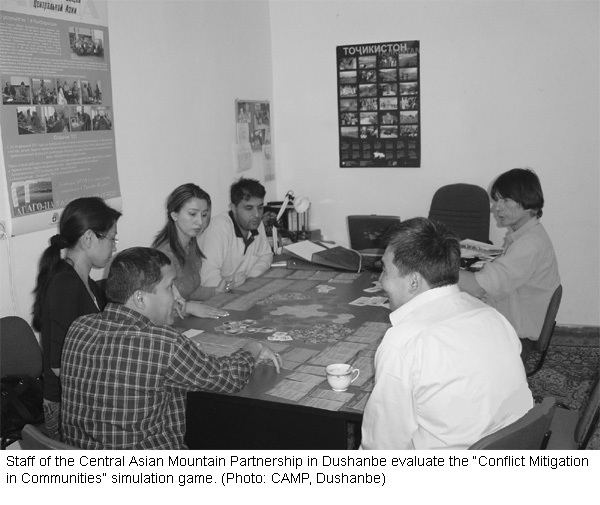 This is the point of departure for a simulation game entitled “Conflict Mitigation in Communities” (CONMICOM), developed at the Centre for Development and Environment under a mandate financed by the Swiss Agency for Development and Cooperation (SDC). In the course of the game, population growth and growing needs lead to an increased demand for water, threatening the sustainability of water use. Conflicts emerge. Will the families cooperate or compete with one another? During the game, players can perceive the development of conflicts, discuss negotiating and problem-solving mechanisms, and mirror them in their own real experiences. A debriefing session with the participants after the game forms a substantial part of the learning process that can reinforce social competence, as well as problem-solving and decision-making capacities. The game is well-suited for use as a module within training courses, for example for project workers. In the past years, the focus of interventions in the water sector has shifted from demand-driven water supply to more efficient water use. This is particularly true of rural areas. 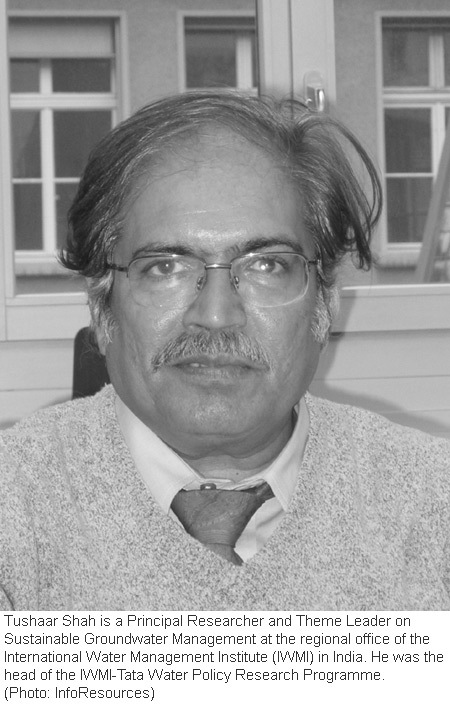 In a presentation at the Swiss Agency for Development and Cooperation (SDC) and a subsequent interview with InfoResources, Tushaar Shah emphasises that the greatest challenge faced by the water sector in developing countries is the fact that it is largely organised within the informal economy. He criticises that important instruments of Integrated Water Resources Management (IWRM), such as water prices, permits and regulations, are based on the assumption that the water sector is part of the formal economy. Water policies that were adequate in the past must be adapted to current conditions. This requires a thorough and extensive understanding of national water economy. Water resource management must not be limited by sectoral thinking; it should include overall development dynamics. Development of infrastructure and services in the water sector remains an important task of the governments of less developed countries. People who are directly concerned must consistently be involved in the planning of interventions. “Technifications” such as drip irrigation contribute to making water use more efficient. Cropping patterns must be better adapted to climatic conditions, and innovative cultivation methods should be encouraged. Creating non-agricultural income opportunities, particularly for the poor, remains an indispensable measure to reduce pressure on agriculture and, consequently, on water resources. See also SDC's new Water strategy: Water 2015: Policy Principles and Strategic Guidelines for Integrated Water Resource Management. Swiss Agency for Development and Cooperation. 2005. 40 p.